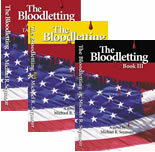 Order The Bloodletting: An American Tale of Revenge today! Order The Bloodletting & save! Buy all three books and save 13%! Already have the first book? The author will sign your book(s) along with a personal message with any order. Great gift for birthdays or Christmas!